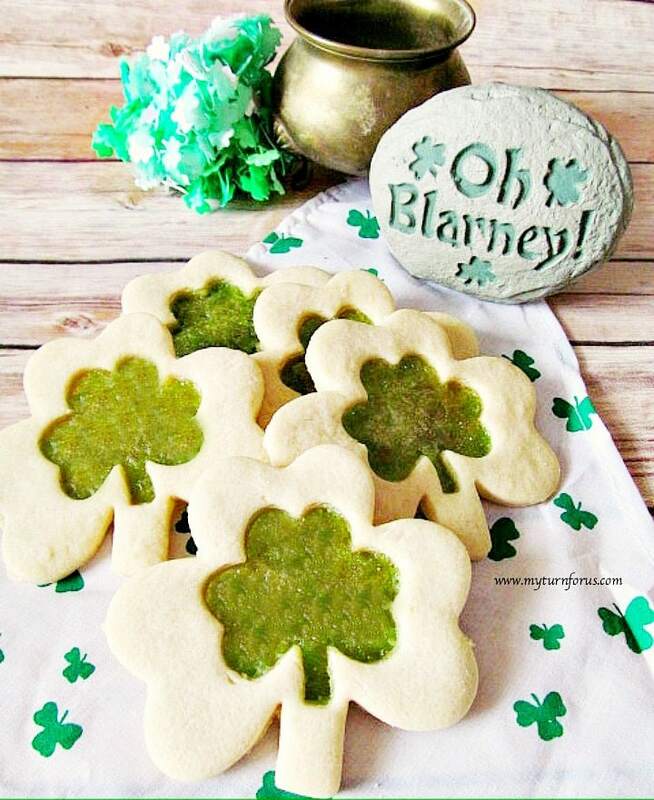 Make these St Patrick’s cookies recipes for easy stained glass cookies or shamrock sugar cookies depending if you use the clear candy centers or not. These Stained Glass Shamrock Cookies make fun St Patricks Day Cookies that we know your little leprechauns will love. St. Paddy’s day at our house has always been just for fun, the abundance of shamrocks, rainbows, pots of gold and leprechauns always bring out anyone’s mischievous side. I drag out all my green depression ware dishes and set them up on tables, throw a few good luck pieces amongst them and add a few shamrocks and then, start cooking anything that is or can be green or rainbow. This post contains affiliate links which means if you make a purchase we might receive a small commission at no additional cost to you. Use a no spread cookie recipe like ours below. You don’t wish for these Shamrock sugar cookies to spread as they bake thus stretching the little pool of candy. Use sharp cookie cutters so the edges are very defined. And with these stained glass shamrock cookies, the smaller cutter must fit inside the bigger cookie. So that there is plenty of cookie around the stained glass area. Jolly Ranchers make easy stained glass cookies but lifesavers will work. Place the hard candies in a ziplock freezer quality baggie and cover it with a kitchen towel. Then pound it with the flat side of a meat mallet on your cutting board until crushed. Make sure when you place the cookies on the cookie sheet, the dough is stuck to the parchment lined pan so the melted candy doesn’t leak. I have been known to serve my children green milk or green pancakes for St. Paddy’s day. So sad my grandbabies don’t live close to us. Because I can think of loads of tricks to play on/with them on this tricky holiday. 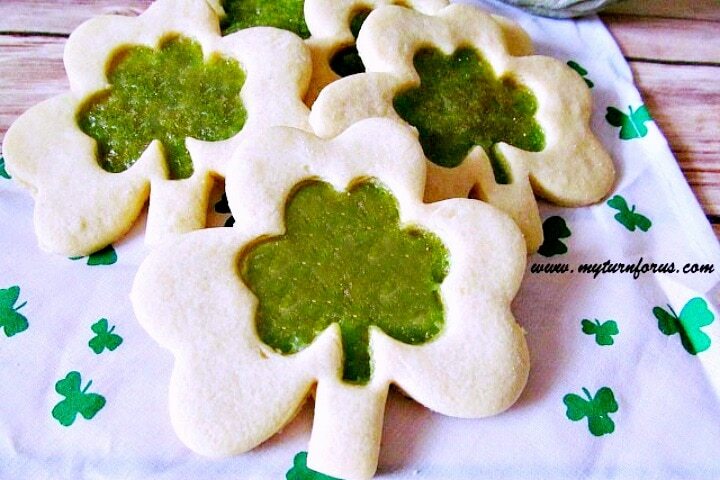 But I can do one thing, I can make and send them St Patricks Day Cookies. And I think they needed a batch of special magic cookies. Cookies with a stained glass translucent center in the shape of all things lucky like these stained glass Shamrock Cookies. Remove dough from the fridge and let stand for 5-10 minutes. On a lightly floured pastry mat, roll out each piece of dough to a ⅛-inch thickness. Using your largest shamrock cookie cutter, cut the dough into shamrocks and place on parchment-lined baking sheets, spacing them 1 inch apart. At this point, you could make plain shamrock cookies and bake these cookies as is. And sprinkle with sugar or green sugar as soon as you remove them from the oven. 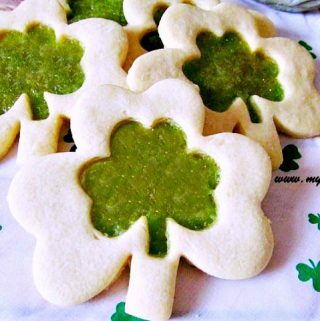 But if you are making stained glass cookies- use a smaller shamrock cookie cutter that fits inside the shamrock cookies to cut out the centers from each cookie. Place the hard candy in a freezer-quality ziplock baggie, throw a kitchen towel over it and pound them with the flat side of a meat mallet until crushed. Spoon the crushed candy into the center of each cookie, filling full. Bake until just golden at the edges, 7 to 9 minutes. Let cool on the baking pans for 5 minutes, then transfer to wire racks to cool completely. These are so cute!! Pinning! I love these for St. Patrick's Day! Pinned!